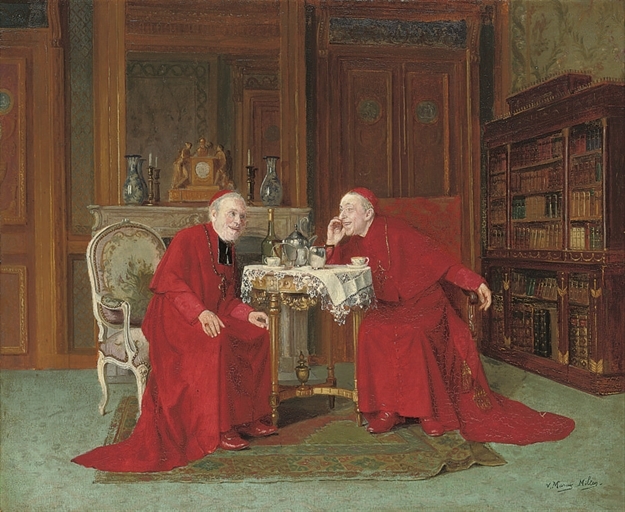 "The domestic antics of members of the higher echelons of the Roman Catholic Church exercised a powerful fascination for a number of popular painters and their patrons in the second half of the nineteenth century. But to understand the original motivation behind this choice of subject, one must not overlook the element, present in varying degrees in most such works, of anti-clericalism. There is no doubt that contemporary collectors and spectators took great pleasure in the sight of noble figureheads of the church reduced to banal, even undignified proportions. The comedy was appealing, and the anti-clerical message suited the prevailing political mood of the buying public." He noted that today, for example, the aspect of "meekness in the community," is a somewhat ‘forgotten virtue’. Meekness is stigmatized, it has "many enemies”, the first of which is gossip. Pope Francis further developed this reflection. “When we prefer to gossip, gossip about others, criticise others- these are everyday things that happen to everyone, including me – these are the temptations of the evil one who does not want the Spirit to come to us and bring about peace and meekness in the Christian community". The Holy Father then outlined the correct behaviour for a Christian. First, "do not judge anyone" because "the only Judge is the Lord." Then "keep quiet" and if you have something to say, say it to the interested parties, to those "who can remedy the situation," but "not to the entire neighbourhood." "If, by the grace of the Holy Spirit – concluded Pope Francis - we succeed in never gossiping, it will be a great step forward" and "will do us all good". This is nothing compared to the anti-clericalism today. In fact I find these quirky and refreshing, not mean in any way. Strange how things evolve?